Identify authentic Autodesk software by checking the bar code. 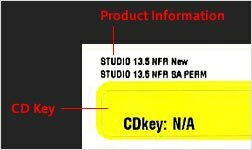 All authentic Autodesk software includes a label with product information including part numbers, bar codes, and a unique serial number. If no such label is on the packaging, the software is not authentic or not properly licensed. CDs and DVDs will never include data printed on a sticker—it will be laser-etched on the CD or DVD. Activation codes will never be printed on the software packaging. If the code is visible prior to purchase, the software is counterfeit.